A hospital’s assets include both its staff and equipment. Keeping both safe is paramount to keeping a hospital running smoothly. Caregivers and other hospital staff can be exposed to risky situations by not having equipment at hand throughout their routine workday. At the same time, a major challenge for a hospital is managing the location and cost of its mobile medical equipment. 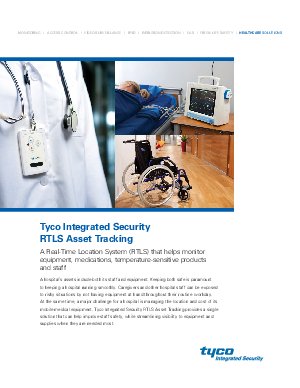 Tyco Integrated Security RTLS Asset Tracking provides a single solution that can help improve staff safety, while streamlining visibility to equipment and supplies when they are needed most.